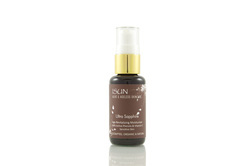 100% active ingredients, ISUN Age-Revitalizing facial oil are formulated to carry ultra-high percentages of stabilized Vitamin C, COQ10 and other potent regenerating and profoundly effective antioxidants and rejuvenating fatty acids, deep into the tissues where true skin transformation occurs. Skin repair and regeneration, natural UV protection with highest levels of carotenes, Vitamin C and other antioxidants and sustained moisturizing properties are maximized with the 100% pure active oils. Anti-inflammatory herbs and oils including Blue Chamomile, help calm skin.